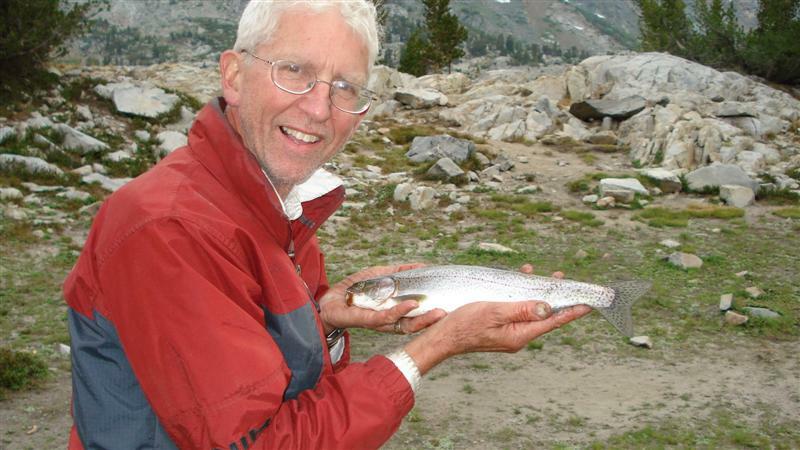 Here, in OUTDOORS we find Summitlake’s collection of articles, stories, slides, photos (and even poems) on an outdoors theme. You’ll discover articles on camping, hiking, hunting, fishing, climbing — and people — connecting with the great Outdoors. Such a place would be public, in the sense of a park or a wilderness, but would be private too, in the sense that no two visitors ever take away quite the same experience. Here, then, we offer pages which best depict the sense of beauty which so enriches life. There are many sources of deep original beauty in the arts, literature, music, media and the theater. 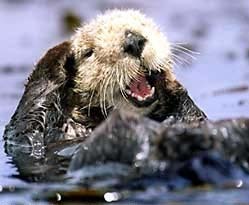 Ultimately, these have their origins in the source material itself: the Outdoors Universe. Work is authored and copyrighted by the articles’ authors and photo contributors. Readers can expand either image to full size by clicking the image. I’m blessed to have explored John Muir’s Range of Light, but wilderness depends on where you find it. It is all beautiful when we learn how to see. I believe we’re all partly self-defined by direct experience of the richness of nature, and obtain our sense of place and belonging from that experience. Just as we can peer into the heavens with a telescope and bear testimony to the miraculous complexity of our universe, so too can we step into our back yard and revel in the layered density of life on Earth. And the odd thing is, for this experience it really doesn’t matter whether we live on the edge of Central Park or the sands of the Sahara. I write of my High Sierras, and earlier of the sweet scent of pine on the Carry Road in the wilderness around Middledam, Maine. And I write of the austerely beautiful Sonoran Desert and the profound quiet of such places. I write of those places because they are the ones I know best firsthand. If we somehow escape all those experiences, cocooned in increasingly abstracted electronic worlds, this defines us too. But, even as age or infirmity restricts our ability to physically explore the external world, we can now access any part of the world or the heavens with cable TV and internet packet routing. The nature and travel specials, the NASA image of the day, the Facebook and BBC updates on Arab Spring – these are all parts of a world we can instantly access today. But it means less if we cannot at least sit outside and listen to the roar of the ocean, the rustle of a breeze through a field, or the chirp of a bird who takes it upon himself to announce the time of day. Some say God’s Country is found in the Rockies, Adirondacks, Great Smokies, or the Piedmont of our southeast coastal states. It is. It also reposes in Big Sky Country, Texas Hill Country, and the vast rolling Great Plains. One might discover the beauty of the Okefenokee wetlands, or dive and see Goliath Groupers and Barracuda in the shallow waters of Key West. One could hope to see Kilauea, the mighty Denali in Alaska, or the Na Pali Coast of Kauai. I wish I could have visited them all. But sometimes stepping out into the back yard will suffice. I happened to notice this photo the other day while working on something else. Click the image to see the linked full-size gallery image in a new window. You see, this is the indelible image that still gives me “falling” nightmares about once a month. That’s me perched on the edge of oblivion out there on the “beak” of Half Dome. The backpack trip was Glacier Point to Nevada Falls to Half Dome. The year was 1972. I would have been 28 at the time, acting half that age. I just had to show I could push it a little further than my hiking companions. My bravely exaggerated pose looks like that of a show-off, which it was, but there’s more. I was braced against any sudden “boo” and joking push from behind. Of course, I wasn’t thinking about earthquake, rock-slide, sudden gusts or something as silly as vertigo. The vertigo with heights came later, mostly from thinking about that full mile’s elevation of fresh, clean air between me and the valley floor, and the vagaries of chance that make the difference between a solid perch and sudden death. Not photographed: toes over the edge, I leaned forward so I could see the valley floor between my feet. I’ve done lots of stupid things in my life, but this takes the cake. 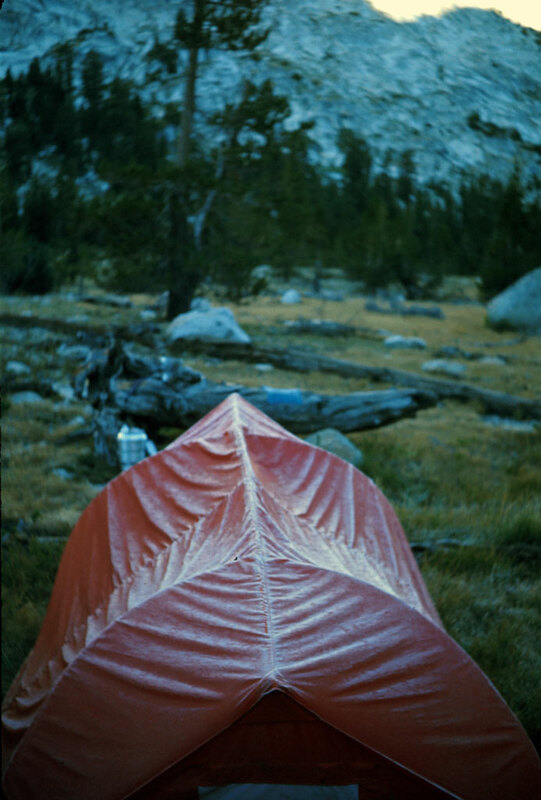 A new slideshow: My 1972 9-day solo backpack into the high country of northwest Yosemite. Slide show of 4 folders – click any folder to view enclosed images. To start, read the ABOUT graphic in the gallery. You may use each picture’s download icon for extra large desktop images for your own use. Link to Jalbum here. In OUTDOORS. Memory is a funny phenomenon. Sometimes it all begins with a simple idea or statement. We mull it over for a while, possibly overnight. We may come away with a connection we hadn’t made before. 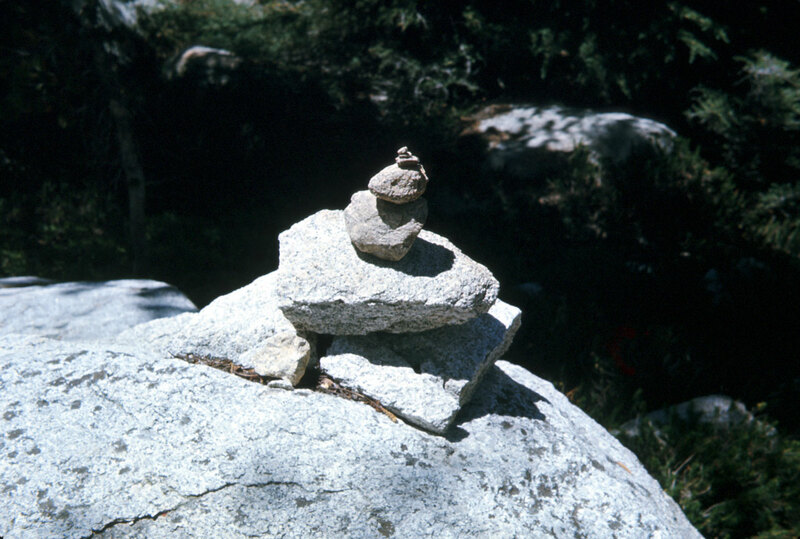 This narrative begins with a connection between a PBS Nature special, and a mis-labeled 1972 photograph. The PBS special was Christmas in Yellowstone. Narrated by Linda Hunt, it gives us a lonely, cold, beautiful view of Yellowstone in winter that few have ever seen. I knew what he meant. I remember clearly when I first fully experienced the understanding. It hit me with a rush. The trouble was, it later seemed I’d spaced out, and never had documented my journey through that valley with a photograph. When I scanned my old Ektachrome slides around 1997, I was burned out by my 2000-slide scanning project and its constant “where was this?” references to the trail maps. I’d labeled the photo in question 07 Virginia Canyon.tif. 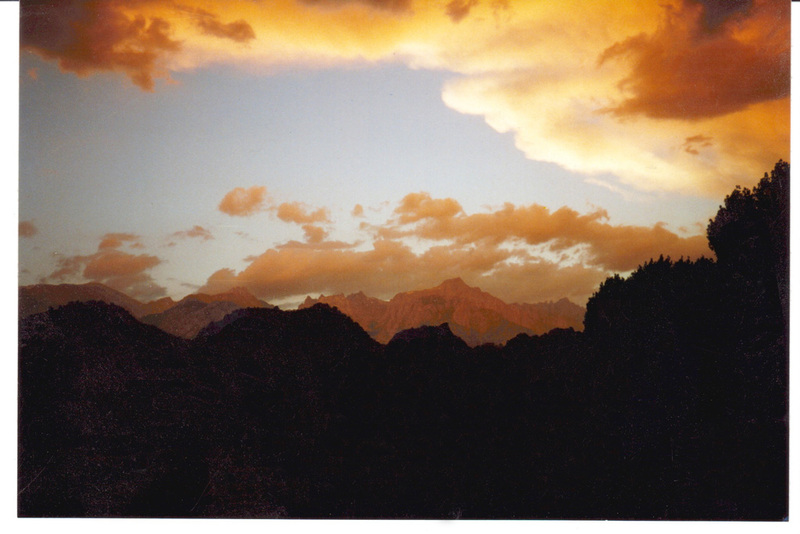 It was a color slide of my 1972 Matterhorn Canyon backpack trip. But we ain’t anywhere near Virginia Canyon any more. Twelve years of confusion ensued. I didn’t really access Matterhorn Canyon by way of Virginia Canyon in 1972. That happened in 1979, as documented in my slide show MatternHorn Peak. 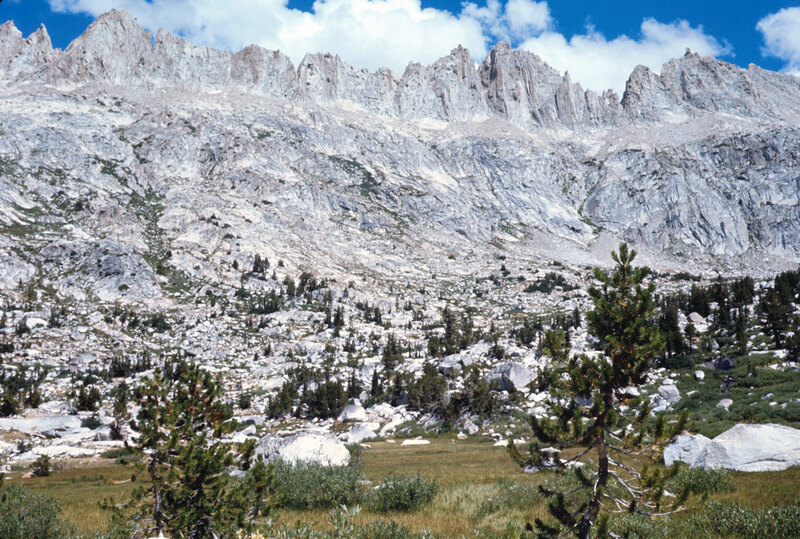 In 1979, the elevation gain was outside Yosemite, then passing through Summit Lake, and finally descending down Virginia Canyon. On my 1972 trip I did it the hard way: uphill. This is actually shown on a map for the 1979 slide show. The panorama below was shot from a high point overlooking Virginia Canyon, but “07 Virginia Canyon” wasn’t. I confused segments of the two trips. 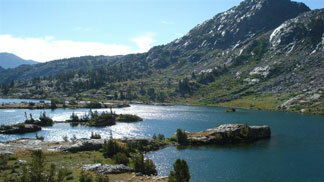 Only the short leg from Virginia Canyon to Miller Lake was common to both trips. 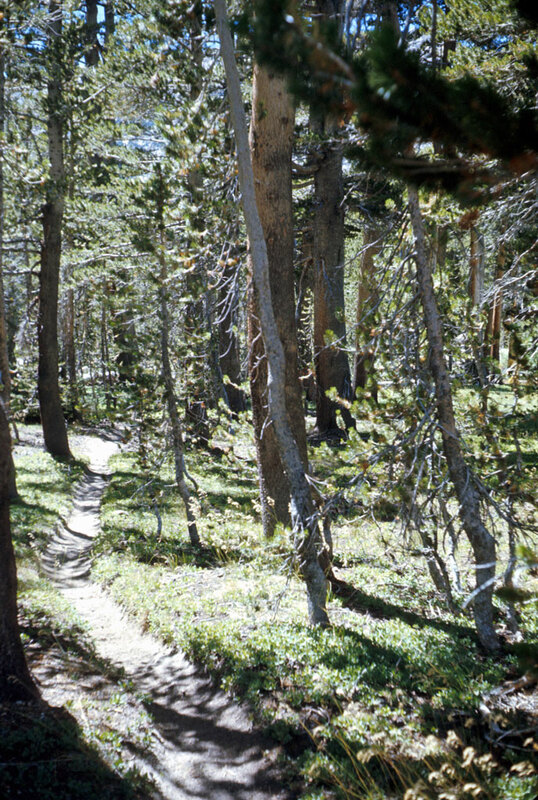 In 1972, starting at Tuolumne Meadows, I began a full 9-day solo, the Matterhorn loop circuit. I worked my way from Glen Aulin up through Cold Canyon, McCabe Creek (briefly intersecting the west end of Virginia Canyon), up Matterhorn Canyon to Matterhorn Peak and Burro Pass. Below Sawtooth Ridge, I continued to Snow Lake and Rock Island Pass, camping right at the lake overlooking the stormy maw of the pass. 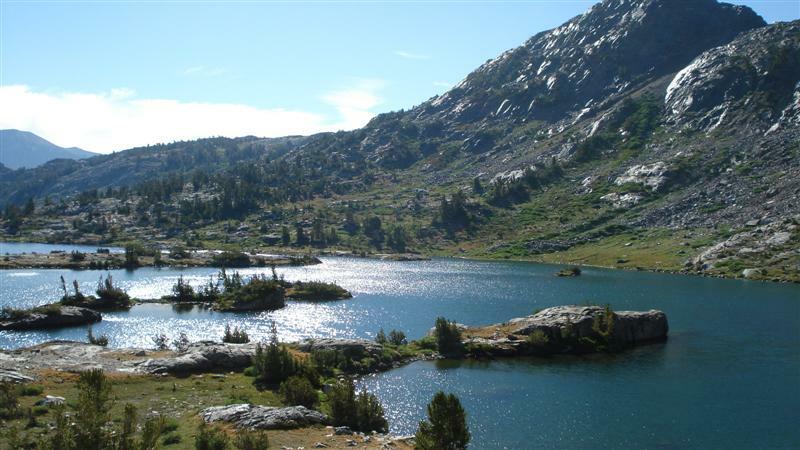 I descended down Rancheria Creek to Seavy Pass, Benson Lake and Volunteer Peak. I then descended Rodgers Creek to Pate Valley on the lower reaches of the Tuolumne (above Hetch Hetchy). After crashing at Pate Valley overnight (so tired even the brown bears didn’t scare me), I began the horrible, hot trudge up the John Muir Gorge to Glen Aulin and back to the Meadows. I use several images below to illustrate this story, and clicking on any one of them will give you a much larger image with good detail. That 1972 trip did produce what has become my fairly popular and maybe even famous panorama shot. At full size, you will need to scroll around quite a bit to see all of the panorama. There is a lot of real estate in this unusual photo, encompassing all of Matterhorn and Virginia Canyons, and Shepherd Crest at the far right. You can spot Sawtooth Ridge as the jagged peaks near the top center of the panorama ridge-line. We are looking up 7 or 8 miles of Matterhorn Canyon to get this view, from the mouth of a pass that descends down into the canyon beyond the north side of Miller Lake. Now, below, see the Day 3 photo and expand it. The file is labeled 07-Virginia-Canyon.jpg, (Click thumbnail for a 1280×863 for your desktop). Looking at the foreground imediately below this imposing mountain ridge, there’s nothing between us and the meadow. We’re right under Sawtooth Ridge. I mis-labeled that photo back in 1997, 25 years after my hike. There’s no way this photo was taken from anywhere near Virginia Canyon! Day 1 only got me as far as Glen Aulin, as I’d only arrived by car at Tuolumne Meadows that afternoon. Day 2 is usually butal on any hike. You “break in” on the first full day’s elevation gains and losses. I only made it halfway up the aptly named Cold Canyon, where I half froze to death. This shot is after sunrise the next morning. Note the rime frost on the tent. Day 3, The Valley: Day 3 was a really long stretch. It got me over Burro Pass and well beyond. This is the “07 Virginia Canyon” shot that’s actually on the far side of the next canyon over: Matternorn Canyon. By the time I reached this unnamed valley, nestled under the protective fangs of Sawtooth Ridge, my day was a little more than half over. As if you could get this far and not know the way, someone had marked it with an over-elaborate “duck” (usually, three marker rocks piled upon one another). At this point I was already tired. An endorphine rush, similar to “runner’s high”, had set in. I was (almost literally) on top of the world. I stopped for a moment and looked about me. I was surrounded by a natural park, manicured by nature; I was a guest in its garden. It was at this point I realized: “This is my cathedral”. And clearly we’ve come full circle to a better understanding of photographer Tom Murphy’s remark. Yosemite is not Yellowstone. I and my little Rollei B35 were not Tom Murphy with his awesome camera and lenses. But I knew what he meant. I’d experienced it too. And I rediscovered the photo that documents it. As the decades slide by like a canoe on rapid water, many memories rush by from view, perhaps never to be regained. Yet others stamp themselves indelibly on the understanding, like first sight of those island universes hanging in the eternity of night sky. The difference, I think, lies in the uniqueness and quality of the experience. The impact of that valley is one of those that never fades. Dave writes: “Here’s a pan of Garnet Lake, near Mammoth. Buddy Russ and I hiked in in July of ‘07. 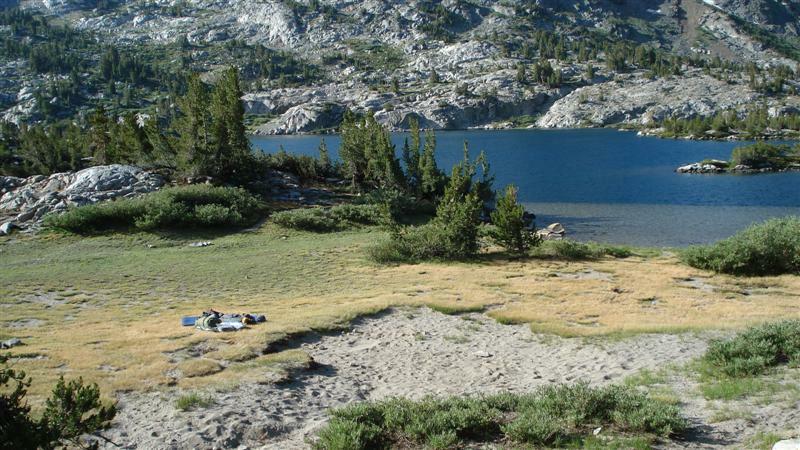 It’s six miles in from the Agnew Meadows trailhead, with an elevation gain of 2,000 ft. I didn’t realize until the first night that I had left my (our only) tent in the car. The lake is around 9,700 ft, fairly lightly visited (we had the lake to ourselves), with good fishing for Brookies and Rainbows. I took some interesting video up there, mostly concerned with the lack of tent combined with the presence of rain. Russ rigged his plastic poncho in the lower limbs of a nearby tree and slept under that. I slept in the open with my bag completely inside one of those aluminized mylar emergency “survival” bags. Worked like a charm, warm and dry, if a little noisy with the rain pelting the mylar. It’s challenges like that that make for a memorable trip. The area, and Garnet especially, is gorgeous. Our camp is on a bay with a shalllow sandy bottom no more than 2-3 feet deep out at least 50 yards, which makes for great flycasting into the deep water at the edge. Check the area on GoogleEarth, it’s spectacular. ” … Click image for larger file. Also browse all images in Dave’s Gallery. Al Jemima and friend at La Loma. Click for larger image. This is a sequel to “Sunrise at Loma Prieta 1979“. This happened on one of the very first hunts to which I was invited. Most everybody had a “camp name” — a name or nickname by which you were known, but mainly in camp. Tom became “Tomasco”. Joe became “Speedy”. Uncle Tom was “Tio Tom”. Here’s the story of how my camp name became “Al Jemima”. I was known as “Al” in those days. And I would keep chatting the subject up to the family patriarch. I would keep telling him, “JP, how do you like your flapjacks? Light and fluffy, or thick and crusty”? At 4AM the next morning I slept right through the alarm clock. No camp cook. No wake-up calls. Not even any coffee. At 5AM we all piled into the jeep in the dark, sleepy, grouchy, on empty stomachs. And to this day, anybody on the hunt that year knows who “Al Jemima” was, and why.